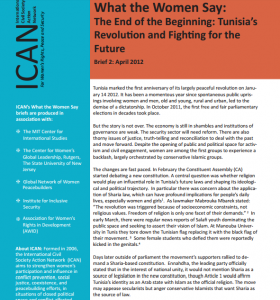 Tunisia marked the first anniversary of its largely peaceful revolution on January 14 2012. It has been a momentous year since spontaneous public uprisings involving women and men, old and young, rural and urban, led to the demise of a dictatorship. In October 2011, the first free and fair parliamentary elections in decades took place. But the story is not over. The economy is still in shambles and institutions of governance are weak. The security sector will need reform. There are also thorny issues of justice, truth-telling and reconciliation to deal with the past and move forward. Despite the opening of public and political space for activism and civil engagement, women are among the first groups to experience a backlash, largely orchestrated by conservative Islamic groups.